What can I say about a book that’s won every accolade there is, including this year’s National Book Award? Well, if you know me, you know I have an opinion on just about everything. 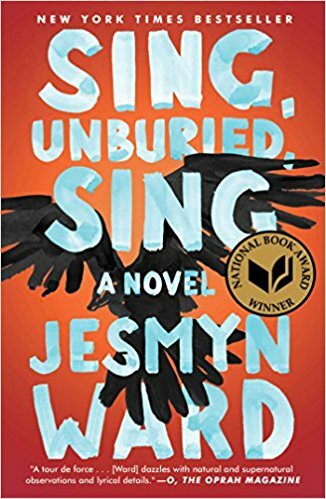 I had the great fortune of convincing my local book club to read Sing, Unburied, Sing with me this month, and I confess I wouldn’t have picked it up—at least not for a long time—if it weren’t for peer pressure. The consensus of my book club was that, while none of us particularly considered it a book of our hearts, we were all glad we’d read it. I’m very selective of my capital-L literary fiction, which I consider a bogus genre. To me, categorizing a book as literary means that hegemonic tastemakers have decided certain books are important and worthy of acclaim, and they’re not usually books I love. As an avid reader of fantasy, romance, and books written for children and young adults, I’m not impressed with Sing, Unburied, Sing’s widespread media coverage and fancy awards. I’m impressed with its lyrical, economical prose, its somewhat archetypal but expertly drawn characters, and its deft handling of the many challenges plaguing black communities in the rural south. Set in rural Mississippi, Sing, Unburied, Sing centers around one family and two point-of-view characters: thirteen-year-old Jojo and his mother, Leonie. Jojo and his toddler sister Kayla are biracial, as Leonie is black, and his absent, incarcerated father Michael is white. He lives with his grandparents Mam and Pop; Leonie struggles to be a good mother but is too-often stymied by her drug addiction. Like many young black boys in his situation, Jojo has had to grow up quickly. His Mam is ill. His mother is an inconsistent influence in his life—when she’s there, she’s impulsive and often physically abusive. His paternal grandfather, Big Joseph after whom Jojo was named, refuses to even acknowledge his existence. The only father-figure Jojo has is Pop, who tells him stories of a young boy, Richie, whom he protected like a younger brother while they were both imprisoned in the Mississippi State Penitentiary decades before. What follows is a relatively straightforward tale in terms of plot—when Leonie receives word that Michael is about to be released from prison, she rounds up Jojo and Kayla and drives there to pick him up—but so richly complex in atmosphere, theme, and detail. The novel begins with Jojo assisting Pop in gutting a goat, with unravelling innards and a smell to make anyone retch, and proceeds to Leonie’s meth-induced hallucinations. In Jojo’s, Leonie’s and occasionally Richie’s perspectives, the novel weaves together devastating truths about family, domestic violence, drug addiction, police brutality, the disproportionate incarceration of black men, prison conditions, and the most hateful kind of racism and cruelty inflicted on the young. And ghosts, who only appear after violent death: the kind that Richie experienced fleeing from prison, and the kind that Leonie’s brother Given experienced, being shot by Michael’s white cousin after beating him at a game. It tells these truths with gorgeous writing that feels emotionally detached in the way that you sometimes need to be, when you are wearied by generations of pain and loss. At the same time, Ward’s writing is so deeply empathetic, never making a clear villain of Leonie or even Michael, choosing to show the reader the various ways they are trapped in their circumstances but never absolving them of blame. Sing, Unburied, Sing also forced me to consider Hauntings as a theme, which I hadn’t fully engaged with back in 2014. I’d written off ghost stories as horror—perhaps revealing my failures as a reader, as I’m not well-read in that lineage either—but I now better understand the power of a ghost story. Why do ghosts come back to haunt? What compels them to attach to a person, or a place? In Ward’s novel, it’s the unburied voices of those unjustly killed, singing enraged songs of retribution and unrest, and seeking the peace they never found in life.